No Way, will I allow the constraints of money, (either the struggle of making it, or the fear of losing it) to steal away my creative energy and distract me from my mission. No Way, will I allow an antique group of “technophobic” marketers, dinosaur promoters or disconnected managers to direct my future and rep my brand. No Way, will I allow gossip, rumors and hearsay to guide my choices and influence my decisions. 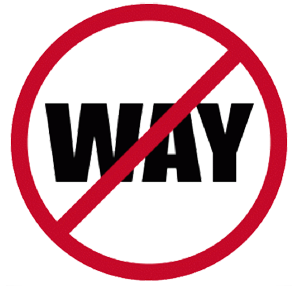 No Way, will I allow the “devil of doubt” or the “demon of procrastination” to stop me in my tracks, or stall my worthwhile projects. I’m a committed artist and a dedicated entrepreneur and nothing will stop me from expressing and manifesting my ideas, innovations and art!